It’s funny looking back on the decades of PC gaming in which we cared so much about graphics cards and rarely gave a second thought to monitors. Only relatively recently have we fetishised panel types, screen uniformity, response times and native resolutions. Even more recently, we learned a new level of neurosis about synchronised frame delivery. Here to tick all those boxes is a trio of MG series monitors from Asus. 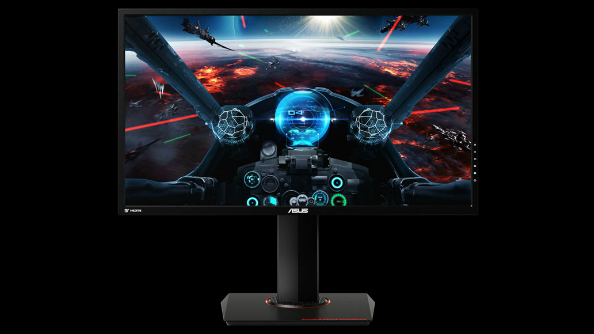 All offer Adaptive-Sync (the collective term for NVIDIA’s G-Sync and AMD’s FreeSync), two of them are 4K natively, and all look very desirable. There are fewer pleasures more pure than loading up one of the best RPGs the PC has to offer, maxed out, on a new system. Which ones make the cut, though? The MG28UQ and MG24UQ are 4K/Ultra HD displays with a resolution of 3840 X 2160, making them a bit of a workout for all but the most ridiculous GTX 980 ti SLI system. As their SKUs suggest, the former comes as a 28-inch panel, and the latter a 24-inch. Interestingly, the MG24UQ is the only IPS panel of the two – the larger screen type is unspecified. Both featureDisplayPort 1.2 (one), HDMI 2.0 (x1), or HDMI 1.4 (x2), so you’re basically sorted for inputs. To my eyes, 4K on a 24-inch screen makes the pixel density a bit too – well, dense – to be comfortable. Each to their own, though. Meanwhile, theMG248Q is another 24-inch screen that runs natively at 1920 x 1080 and up to 144Hz. It’s intended for console and PC use, say Asus. For many, an IPS with a high refresh rate and Adaptive-Sync is the holy grail right now. Particularly one with a 4K native resolution. But 24 inches? To me that’s a drawback, and these peepers can’t handle the pixel density of 4K at that size. The two 4K panels are available worldwide as of now, while the 1080p model follows in around a month. No word on pricing yet though.